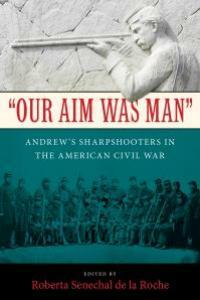 “Our Aim Was Man”: Civil War Sharpshooters An inheritance of Civil War letters led to Professor Roberta Senechal's book about Civil War sharpshooters. Q: Where did the idea for this project originate? I’m not a Civil War historian, but my great-great-grandfather was a member of the First Company Massachusetts Sharpshooters, also known as Andrew’s Sharpshooters (in honor of Gov. John Albion Andrew). I inherited about 65 of his letters written to his wife and his children during the Civil War. He was really good at describing all of the troop movements, what camp life was like, the weaponry and the training — everything military. Initially I thought I’d transcribe the letters and publish them, but then I realized how unusual his unit was. And then I thought it would be great if I could find other members of his company to include. The unit had only about 100 men, so I wasn’t optimistic that I’d find anything. A long of period of research —the miracle of the internet! — turned up three others. The first was bound for Harvard and was very literate. He wrote wartime letters to his fiancée and then wrote a 100-page memoir of his service with the company. Another was a shoe factory worker who kept a brief diary, and the fourth was a farmer who wrote letters home to his wife. So I had pretty good coverage of the war through these documents. I made a chronological account from the beginning of their service and was able to use at least two voices at any point in time. It’s an interesting way to construct a narrative because usually, whether it’s history or anything else, you’re following one individual. Or you have a faceless unit. But here you have a factory worker, a member of the middle class, a skilled craftsman and an average farmer. The book has a nice cross-class perspective. Records written by sharpshooters are very, very rare. But these sharpshooters, men who are skilled with a rifle over long distances, were also among the first true snipers in the American military. They had long-distance telescopes on their rifles, although their telescopes don’t look like the ones used today. These ran the entire length of the barrel, and they were able to sometime hit targets as far off as 1/4 to a 1/2 mile away. The average foot soldier didn’t get that much training in how to shoot. Musket bullets didn’t go straight, they followed a parabolic course, and it took a long time to learn how to put the bullet where you wanted to, whether you had a telescope or not. One of the interesting things is the rarity of any descriptions of actual Civil War snipers in action. How were they trained? How were they developed? And how did they feel about being able to see the target they were shooting? I think there is an ongoing fascination with this aspect of sniping. It does seem — at least from the sniper’s point of view — to be such a personal process. Q: How did other soldiers or the public view their line of work? Occasionally, among the snipers, the question of morality of this kind of behavior does come up. It was interesting to me to see how they responded to the queasiness of civilians who claimed that they were shooting at men for pay or for sport — trying to run up a score. One sharpshooter wrote that he only shot people when it was good for the country. He made it very clear that their role was to protect the troops — especially from enemy artillery. His concept of what they were doing was not picking people off for the fun of it. Rather, he felt bad about the men he wasn’t able to protect. The other question that comes up is what kind of person would do such a thing. They must be a little weird, a little abnormal, socially isolated, mentally ill or not like other people, somehow. One of the things I noticed from the beginning with these men is how completely ordinary they were. They were professional and workmanlike. Like any soldier, they didn’t want to be fighting and shedding blood, but it was a job to be done, and they went about it in a very disciplined fashion. There were some younger men who bragged about how many they killed. But my four sharpshooters seemed perfectly normal. They had lots of friends back home, and they were very sociable as they moved through the war. Q: Did this line of work leave lasting scars? What seems to have been more traumatizing was coming upon the aftermath of one of the battles. Because they were separate from the main troops, sharpshooters didn’t serve on the front lines. All of them expressed profound shock at the carnage they witnessed after the Battle of Seven Pines-Fair Oaks, near Richmond. It was a slaughter pen. They didn’t describe it to their families. Their line of work, in contrast, was very focused and didn’t seem, from their perspective, to be senseless. Q: What was the most rewarding part of your research? The most pleasant part was visiting three of the communities where the sharpshooters were from. I was very fortunate, because in two of them, I was able to get a tour of the houses where they lived. My biggest thrill was meeting the great-granddaughter of the man who was going to attend Harvard. It seemed as though time suddenly collapsed, especially when I saw the homes. Between seeing the homes and getting those intimate tours, these men (and their families) became flesh and blood to me. I also now correspond with the great-great-grandaughter of the shoe factory worker. My great-great-grandfather mentioned him a several times — they were actually tentmates – an almost unbelievable coincidence. Q: You were considering a career in law, when did you change your mind? I thought I might go to law school because I had friends in law school, and I had practicing attorneys as friends. I spent time at a law library looking at what I’d be doing and eventually said to myself, “I don’t want my brain to turn to stone, I need some kind of constant intellectual stimulation.” I attended the University of Southern Maine, and while I was there I had mostly very young history faculty, many of them with Ivy League degrees and fresh out of graduate school. They were in love with what they were doing. I remember in many of my classes sitting there thinking what a wonderful life it would be if you could read and write and lecture and be paid for it. It looked like paradise to me. I became a faculty member partly because I get to talk all the time, about my work or somebody else’s. Just put me in front of a class — I feed off it. When I arrived in 1989, the teaching here was good already, but it’s gotten better and better over time, because the overall ability of the students has improved. I can ask my students to work hard, and they respond. They like a challenge and they appreciate getting a good education. They are very competitive, conscientious, serious, professionally minded people. It’s a great place to be. Q: As well as scholarly writing, you’ve also tried your hand at creative writing. Yes, I have a chapbook of about two-dozen poems coming out with Arcadia Press in the fall of 2017. I also won their annual award. I’ve been fortunate to have published quite a bit. I hope it keeps coming. It’s not like history, where you have control of everything. For me, poetry just comes, often unbidden. The chapbook was an emotional project. It’s kind of dark. When people ask me what my poetry is about I sometimes say it’s a rage against transience. The editor at Arcadia Press said, “There’s not one voice here, there’s a community of voices.” I didn’t realize that. I’m quite indebted to him, because I didn’t have a sense that that was what I was creating. I’m both a historian and a sociologist of violence. I publish in both fields. My first book was on the Springfield race riots of 1908 — an anti-black riot — and I have been interested in collective violence ever since. I offer a course on the History of Violence in the U.S. and a course called 9/11 and Modern Terrorism. Also I enjoy teaching my course on the Gilded Age in the U.S. because my favorite historical period is the Victorian era. I cover it heavily in my women’s history course as well. One of my back-burner projects is to develop a new theory of religion. It would address such questions as: when does it occur, when do people interact with supernatural beings — such as ancestors or ghosts or gods — when do people pray to God, and when does the supernatural inflict vengeance and punishment on people? I’ve got a paper called the “Behavior of the Dead,” which looks at when the dead —whether they are ancestors or ghosts, however they are defined in a particular culture —take vengeance on the living. There are some settings across all of human history where the dead come back and haunt you, while in other settings the dead simply dissipate into the mist. I’m curious about the variation the behavior of the dead and of other supernatural entities that are said to punish humans.